A cargo ship ran aground in the Columbia River at Kalama on Sunday afternoon near the iconic totem pole in Kalama Marine Park. "We knew something was wrong," said Karyn Fess, who lives nearby and comes to the park regularly with her husband, Mike, to eat lunch and watch the ships go by. The Fesses, saw the whole thing, which happened shortly after 1 p.m. Sunday. "It was coming the way they always come," Mike Fess said. "They usually turn ... and then I said, 'What's going on?' " Instead of turning, "It took out some of those pilings" before running aground, his wife said. They said it stopped short of hitting the totem poles, including the 140-foot totem carved by the late Chief Lelooska. It's acclaimed as the tallest single-tree totem in the Northwest. The U.S. Coast Guard said "a steering casualty" caused the 197-meter-long Pacific Flores from Hong Kong to run aground. Petty officer first class Tom Zeiner said the Coast Guard is investigating to determine the exact problem. Two tugboats efficiently guided the undamaged ship back out into deep water as a large crowd of onlookers lined the shore, despite the rain. "This is getting to be a regular picnic," said Cathy Showalter of Kalama as more people arrived. "Word gets around." "This is so cool," said Dakota Moon, 11, of Kalama, who watched the tugs at work with her brother, Sutton, 8. "We've never ever ever seen anything like this before." 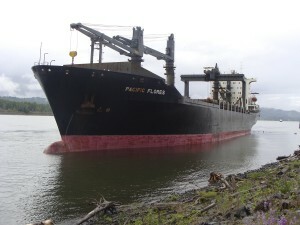 Zeiner said the ship had just left the Port of Kalama and was en route south to the Port of Vancouver. It carried no cargo, he said. No one was injured and there was no pollution, he said. The tugs safely removed the ship to the Kalama anchorage, where the Coast Guard will finish its inspection and will decide when the ship will be allowed to leave, Zeiner said.